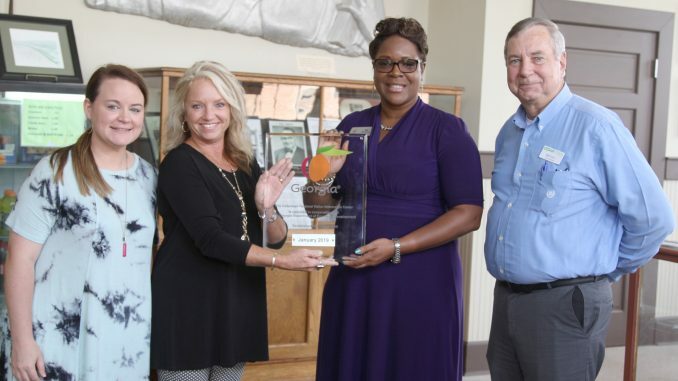 The Cedartown Welcome Center was presented with a plaque from the Georgia Department of Economic Development on Sept. 25. Nija Torrence, operations manager with the GDED, gave the plaque to Downtown Cedartown Director Ramona Ruark. The plaque denotes the Cedartown Welcome Center’s recent designation as a Regional Visitor Information Center. Torrence commended the Welcome Center for earning the title. There are approximately 60 RVICs in the entire State of Georgia, with the closest ones being in Douglasville and Cartersville. Going forward, Ruark explained, visitors and Silver Comet Trail riders will see new Georgia branded items in the center as part of the recognition which includes a plaque and Georgia floor mats and decals. Roughly 10,000 visitors enter the door of the Cedartown Welcome Center every year. The guest book that sits on the main counter bears names of thousands that stepped on Cedartown’s welcome mat, some as close as Marietta or Tallapoosa, and some as far away as Lyon, France, and Vancouver, Canada. Whether it’s stopping in for a map of the Silver Comet Trail, picking up a local events calendar, or just popping in for a cold drink of water, the Welcome Center serves as a hub of hospitality and information. The designation also gives Cedartown and Polk County the opportunity to provide Georgia branded merchandise to local businesses at cost. Requirements to become a RVIC include: a permanent brochure rack with at least 50 percent of materials supporting Georgia cities and tourism attractions outside of Polk County, a minimum of a five-day operating schedule, public restroom, located near a highway, open one full year, a full-time manager and appropriate continued education and cross-training for on the duty manager among others. Those present for the presentation included Cedartown City Manager Bill Fann, Torrence, Ruark, and Polk County Chamber of Commerce Executive Director Blair Elrod.